How Many Social Psychologies Are There? (A. Eskola). The Experiment in Social Psychology: Alcohol Research as a Case in Point (O.-H. Ylijoki). The Psychological Foundations of Social Psychology (K. Weckroth). 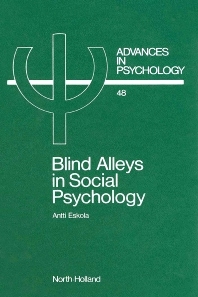 Social Psychology as an Historical Discipline (A. Eskola). Non-Active Role Playing: Some Experiences (A. Eskola). References. Indices. Real advances are not made in blind alleys (or culs-de-sac). In Social Psychology, as in every branch of science, the paths which appear to offer progress do not always result in theoretical elegance. Certain basic problems persistently defy final solution. This volume surveys the foundations and methods of Social Psychology with the aim of identifying ways out of the research maze. It examines the history and traditions of the field, looks at methodology and conceptual schemes, and discusses the actual research methods used.